I met with Erin back in July shortly after the birth of her beautiful second daughter. We met in a Joe Black coffee shop and enjoyed some yummy lattes while she chatted about her musical experiences. Quickly into the interview I realized how much Erin and I were alike. Her honest and intimate answers were so revealing about how much in common our musical goals are. She talked about patience and making the right decisions when you’re ready (something that constantly frustrates me) and about and much more. I feel we really connected (I hope Erin feels the same way) after that afternoon together. I later listened to her music again on Soundcloud (link at the end of the article) and after hearing about where her inspiration came from, everything just clicked. I absolutely love her voice with its folk and jazz influences and the guitar accompaniment perfectly compliments her voice. Definitely super talented. Ashley: Whenever you have a show? Are you contacting and hiring other musicians? Erin: I hire other people. For the most part I work with a guitarist and producer named Larry Roy. The music is ours, we write together so we are a duo. We go together. As much as I can when I’m out [working], I’ll work with Larry. Sometimes other people will hire me as a singer for their ensemble or group for whatever they are doing. I have occasionally, but not often because I focus so much of my time with Larry, I have done duo gigs with other people just to stretch myself and work with someone else and we’ll both contribute 50/50 to the music. Whether they are playing and I’m singing and who is choosing or writing the music. Ashley: So, how long have you been singings? Erin: My whole life, I’ve always loved to sing since I was little. I started taking lessons when I was twelve until I finished university when I was 27. I took piano lessons from age 6 to high school. Ashley: So why did you make the decision to perform? Erin: I have a lot of ‘youngest child’ qualities. There are four girls in my family and I am the third of four but I was the youngest child for nine years before my little sister was born so I always want to tell the funniest story at the family gathering. I want to do the funniest dance and everyone is going to watch me. I just want to be in front of people, it’s not because it doesn’t scare me because it always has and I get nervous all the time, but it was something I just felt I had to do. I felt I owed somebody and that I needed to be in front of people. I just liked it. Ashley: How often are you practicing singing? Ashley: Who inspires your music both lyrically and melodically? Erin: Lyrically, my own experience’s from life. I’m finding my music is becoming, when I get a chance to write, is very domestic sounding and which makes sense because that’s where I am. I’m at home, I’m in our yard, I go grocery shopping, I feed children and I wipe bums. The things I’m doing, I don’t write about wiping bums, but stories that revolved around home and around those small things that happen. Those subtle moments between couples that tell a lot more than what it would appear to be on the outside. Hopes that I have for my children, looking at years to come. The things that I’ve written for our first album, in a way were 15 years in the making for me. A lot of things I wrote for it were written years ago in my life that just needed to come out at some point. They finally came out on my first album; they were older stories. Lyrically my music comes from personal experience but I also find that I don’t have enough personal stories or experiences to make that many songs very interesting. So I borrow from other people’s stories as well. One of my songs is a little bit about me but is a lot about a friend of mine too. I combined our two life stories into it. One of the songs on my album is about my sister, my parents and my grandparents; I put them all together in one song. One song is about Larry, I try to include his feelings lyrically when we work together. A few years ago, I wrote a song for a friend who had experience a great lost and that was the first time that I wrote for someone who was new in my life. A story that was a little bit at arms length, I didn’t know them as well [as the members of my family]. That was a step away for me. Musically; chords, harmony and rhythm, that one is always really hard. I do that so much with Larry. I will write a lot of harmony for our songs. Probably the more and more my songs are being influenced now by songs from my childhood. Those are the songs that are coming back to me as I sing to my kids when I’m staying at home. Irish folk songs are coming back to me. A lot of my melodies sound pretty folky, but I try to make the harmony more interesting that just G, C and D because that’s really boring to me. When I’m writing harmony for something I ‘ll look at jazz standards that I learned in university and ones that I didn’t learn that I’m just learning now and I’ll copy something that they do. I’ll look at their chord progressions or I’ll just forget about my lyrics and put them to a jazz standard or I’ll take a jazz standard and put lyrics based to that. I’ll take a 4-measure section of a tune that I like and I’ll take that out and I’ll try to write something over it or maybe I’ll change one chord in the configuration to make it original and try to come up with a new melody over that. Ashley: So what accomplishments are you most proud of? Erin: I was really proud of graduating from university. That was a big deal for me. It was a big deal for me to go back, I was 24 when I started the degree. A lot of my friends that I grew up with got married young and had kids. I got married young but we weren’t thinking of having kids yet at the time so choosing to do a four-year degree was putting it off until I was almost 30. But I honestly wasn’t thinking about that at the time. I think part of me thought I could never do it. I had quit a couple things in years previous. I started projects and quit them and I was starting to feel that maybe that’s what I was, that I was a quitter. So starting to that degree and committing to four years was something I thought I would never be able to do. It was very scary. I deal with fears that have nothing to with music, I have some general anxiety problems and just some other stuff going that go around in life that make it hard to be around people are finish something. So I’m really really proud of that accomplishment. Doing the album with Larry, when I started my degree and I met him, I never would have guess that I work with anyone on faculty. It’s a big accomplishment that he chose me as a friend and as someone to work with and since I was a kid, dreaming of being able to put my music on something tactile and giving to people. People had been asking since I was 15 for a recording. It took until I was 28 or 29 to put it out there. That was a really big deal. It was a long time coming. Ashley: So you took some time before you put something out there. What advice do you have for people who want to do music that don’t feel like they’re ready to get their music out or are too afraid? Erin: For not being ready, I would say its okay to not be ready. Most of the world is not ready and you want to feel ready. It’s an expensive thing to do if you want to do it well and you want to do it right and it’s a lasting thing to do. You want to feel like you’re in a project, whether is a band or solo act or working with a certain producer, you want to feel like you’re putting your time and effort, your gift, your talent and your studies, and your money behind something that is worth your while. It is okay to not be ready. You make yourself ready. I had opportunities before this album with Larry, and there was always something that felt a little funny. I just wasn’t sure that’s what I wanted to put my name behind first. And I don’t regret those decisions. It felt frustrating at the time; I would think, ”maybe I should just do it.” Maybe it’s different for other people but that’s how it was for me. I wanted it to be really really good. Some people in my life have told me I take things too seriously and maybe that’s true. Maybe I take myself too seriously but it’s worked for me. To be a serious person and wait for good timing, I think that there is a lot of value in delayed gratification. Take your time, it’s okay. As for being afraid, well that’s just something that a some point that you just need to choose that its what you want to do and get out there and do it. I’ve chosen not to do something that I didn’t want to do and I’m let myself down in different areas where I just decided, “nope I’m too scared to do it.” You don’t want to have those big regrets at the end. Or maybe you don’t care, maybe you don’t mind living with a little regret. I do. I have a few regrets in my life that I wish they weren’t there, that’s why they are regrets. At some point you just need to chose it, and if you need to go to counseling it’s totally find, [I’ve] been there and probably will be there again, or you just need to start small, like talking to people about it. Doing a small coffee house show and only inviting people you feel comfortable with. That’s fine! Do what you need to do. Or you need to jump in and do something crazy to get you started. Maybe something crazy to you is getting up a jam session, maybe crazy to you is signing up for a noon hour recital or something. Yeah! That’s pretty scary, but maybe you need to do that one crazy thing, fail and fall on your face, that’s okay. Or maybe you’ll be awesome. At some point you need to choose. It might be something small, it might be something crazy. Ashley: What do you do when dealing with nerves before a performance? Erin: Well what I want to do just not talk to anybody. People want to be all chatty and gabby with you and I’m just like, “get away.” I want to think of my music, go through the lyrics and go through a couple trouble spots that I’m particularly nervous about. I’ll go through five-or-so spots in my set, “this is the place where I could totally screw up and the song would fall apart” so I got over that part mentally. I started to try to do this thing called “positive visualization” where you imagine yourself going through your whole set flawlessly. Get all the bad stuff out of there and imagine yourself doing it flawlessly. I don’t like to talk to people, I’ll just do that alone. Ashley: What is your favorite song to perform live? Erin: For the past two years or so in Larry and my set, my favorite song to do it Waters of March. It’s not even an original it a standard by Antonio Carlos Jobim. (Click here to hear what it sounds like!) It’s normally done in Portuguese but I haven’t tried to learn the Portuguese yet. There are so many words in it but we do based on an arrangement based on Cassandra Wilson. I love her band, she always has a great band. Her arrangements are almost always really cool. The groove that Larry plays with it is really cool and it’s intense at the same time and it’s beautiful and its fun. Ashley: How to do you balance music with other obligations? Erin: I’m learning. Right now I’m in phase where I have a newborn at home so it’s all about her. That’s all. It’s more of a mental balance that I have to remind myself every couple of days that this is what I’m meant to do right now. These are the choices I have made, I love her and it needs to be done. There is just nothing else. So that’s where I’m at [right now]. What we are planning is, she’s getting used to using a bottle now and now I can get out for a few hours in the evening and my husband can help out. I have never been someone whose want to gig multiple times a week just because I love to be at home and I love my kids and I love my husband and I want to be there. It takes a lot of planning. My obligations are my family so it’s just planning to make sure a kid is comfortable, breastfeeding and on the bottle so I can do rehearsals a couple times a week, do some studio time, finding really great babysitters and I have really great family to help out with that; and emotionally tearing myself away from my family once or twice a week to write and practice. I’m going to have to do that. I’m not there yet because she’s so young, but I’ll have to get there in the next couple of months. Making the choice to keep writing and sacrificing a few hours a week with my babies. I have to do that. Ashley: Do you feel that songwriters should have some sort of structured education for singing or do you think that as long as they are practicing everyday it’s okay? Erin: I would really prefer to hear a voice that at least as the training over a voice that hasn’t. Ashley: What do you hear when you listen to an untrained voice? Erin: You can pick this stuff up when you have a good ear and listening to trained singers and figuring it out for yourself. You’ll hear a nasal tone, weird vowels and not that I don’t do weird vowels sometimes but there are some really weird vowels out there. You’ll hear people who really aren’t singing with their real voice yet because they don’t know how to breathe properly and it kills me. Not because that’s what I have to hear but that’s what they have to work with. They could be doing so much more. Just taking a couple lessons with somebody. I’ve had students that once they learn how to breathe properly, they sound completely different. Those kinds of things kind of drive me nuts. I think you can be a great singer without any formal training if you just have a good ear and are willing to get the best for yourself, then you’re going to reach out somehow. You’re going to figure it out somehow and that’s fine. Ashley: What’s the best advice you’ve heard since you’ve started working in the music business? Ashley: No I want to hear! Erin: Okay, I was at a music conference and Steve Bell was asked to play there. He’s a very well known Christian artist and he’s a great singer and guitar player. Every year he does a show with the WSO and it sells out. He’s won lots of awards and he’s from Winnipeg. This high school student stood up and asked “Mr. Bell, what would you say if I said I was interested in going into music, what advice would you give me?” And Steve said, “If there is anything else that you can do, you should do that.” He’s [meaning] instead of music. He’s talking as a person who is in his second half of life who has worked hard, I don’t know him personally but I imagine he works hard, to raise and support a family and he probably had things and lost things and had things and lost things and there is so much more stability in another career. You’d have to ask him specially why he said that but I found it very interesting and very honest. It makes you honestly look at yourself and what you want out of life. Do you want to buy a new blouse every week and go on a snowboard trip every winter and have a new car every 10 years or have a car? Do you want to not share an apartment with somebody? Do you want to not rely on sharing a rental space with someone? Then [music might not be] the route for you; you have to look at what kind of lifestyle you want and what expectations you have for your life. The other best bit of advice or just statement that I heard was probably back in university and Steve Kirby said to someone in our class, “You don’t even know what your don’t know.” That has meant to a lot me. It’s meant a lot to me about humility, of not going into a situation assuming I know where everyone is coming from or that I know much about music at all. I have to assume that I can get something in any situation from other people that are positive things. That other people have wisdom to share from me. Instead of going and assuming that I’m the one who has the wisdom and that works everywhere in life. 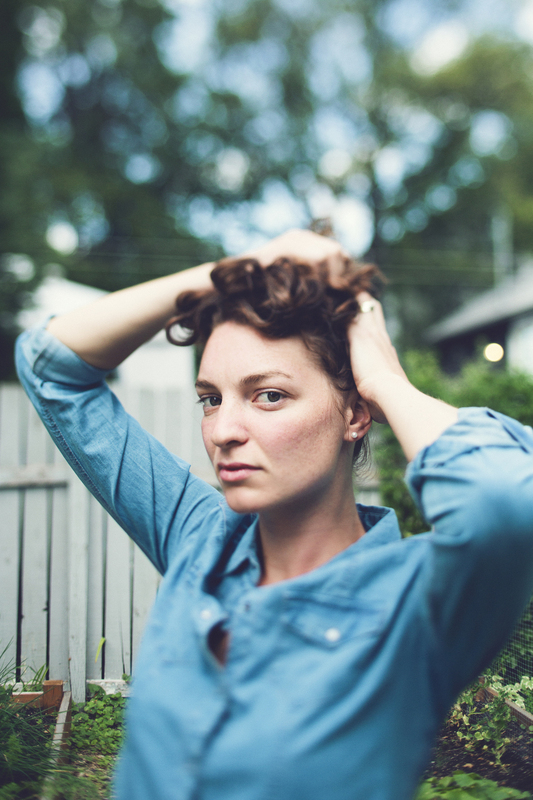 Support Winnipeg Musician Erin Propp!